Discussions around beloved childhood books brings out the best in people. To-ing and fro-ing regarding the merits of Spot VS Clifford; whether the means to an end justified Harriet’s spying habit; whether the rabbit hole is equal parts philosophy and mathematics and indeed, did Hermione ‘settle’? You never forget those characters or tales that brought joy, comfort, amazement and thrills to your small heart and sharing and discussing those love affairs now as adults allows you to relive the joy. Seeing those familiar book covers of the classics transports you back in time, makes the world A-OK and I must say, there is no greater thrill than introducing your own children to those very same titles as you fervently hope that they love them as much as you did. Every year since 1945, the Children’s Book Council of Australia has designated one week a year to celebrate all things reading with Children’s Book Week. Libraries and Schools around Australia organise extravaganzas, activities and competitions particularly acknowledging Australian authors and illustrators but generally rejoicing in the written word and teaching our children to do the same. This year’s theme is Connect to Reading and, through Children’s Book Week, little eyes, minds and hearts will be opened to the joy that is truly connecting with a story, its characters and exploring brave new worlds. 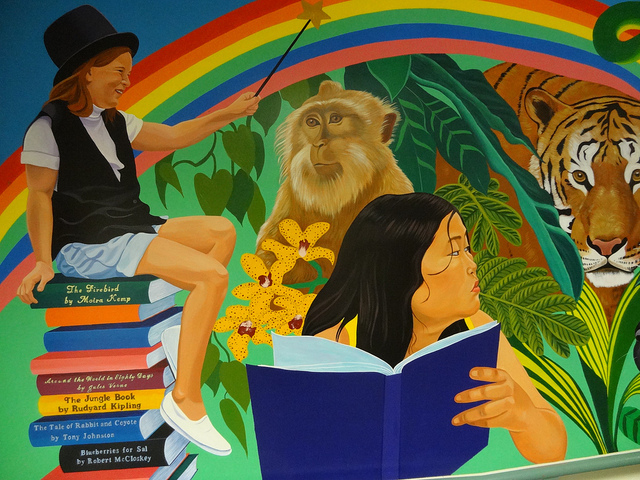 Children’s Book Week 2014 runs from August 16-22 and QUT Library will be celebrating with a display in the Curriculum Collection at Kelvin Grove from Monday 18 August. So, come along – if you want to come dressed in a wolf suit we won’t tell – and check out the fantastic displays and wonderful books on offer for the little people in your (rich inner) life. The Curriculum Collection is located on the fourth floor of Kelvin Grove library and includes everything from high school maths textbooks and teacher resource books to young adult fiction, posters and charts, children’s picture books and finger puppets. 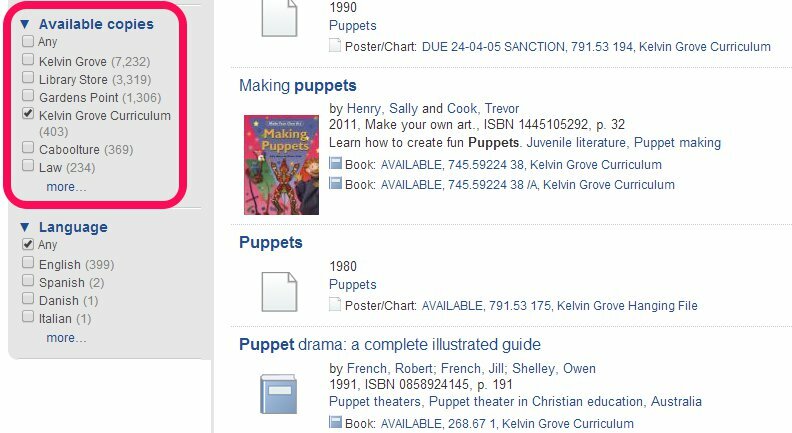 You can search for items in the collection using Quickfind and selecting Kelvin Grove Curriculum in the Available Copies refinement tool (see image). We have also made a guide to help you navigate the collection and find different types of resources. Are you in the faculty of education? Do you have opinions about cool stuff the Library should have in the curriculum collection and the sort of space that it ought to be? Faculty of Education students are invited to join a small focus group discussion Each participant will receive a $20 Coles/Myer voucher. When: Tuesday 5 November 10:00am to 11:30am. Light refreshments will be provided. Places are strictly limited to 15 and will be filled on a first come, first served basis. Please register your interest by emailing r.harrison@qut.edu.au by 5pm Friday 1 November. QUT Library needs your help to create a groovy new library space and cool stuff to put in it. We are already pretty proud of our collection: heaps of books, puppets, maps, games, rocks, construction sets and more. But we want to be even more spectacular (is that even possible?). Can you help us? We need YOUR input. 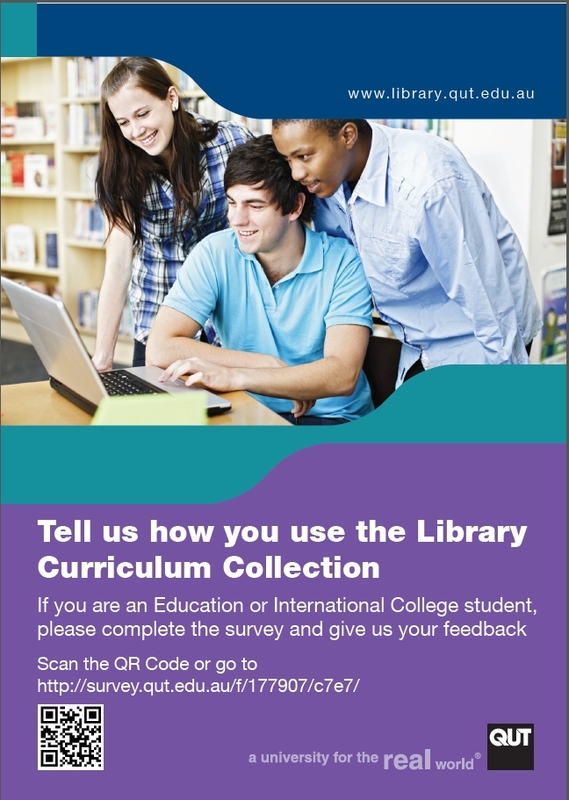 The survey is open to education students only until 3 November 2013 and upon completion of the survey you have the option to enter the draw to win one of four $50 Coles/Myer vouchers. Many students use the Curriculum Collection for assessment tasks, as well as while they are on placement. To clarify some of the confusion regarding placing holds on Curriculum items, read on! Yes, you can place a hold on items in the Curriculum Collection! However, the student who has the item will not receive a recall notice advising them to return the item within seven days. Students often take Curriculum resources with them on fieldwork, and as it may be difficult for them to return the item earlier if it is recalled, they are given the full 42 day loan period. You should place a hold, though, if you require the item, as the student who currently has it will then be unable to renew the item at the end of the 42 day period. 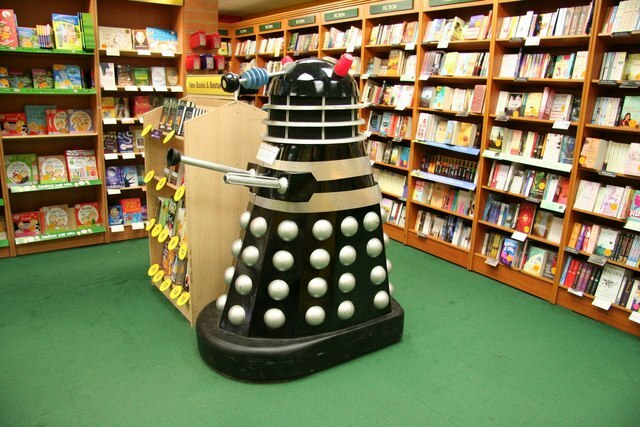 As soon as they return the item, you will be notified that it is on the holdshelf, waiting for you to pick it up. IMPORTANT! As you won’t receive a recall notice when a hold is placed on Curriculum items you have borrowed, unless you attempt to renew a Curriculum item and fail, or check it in the catalogue, you won’t know if there’s a hold on it. If there is a hold and you fail to return the item on time, you will be penalised 40 penalty points a day! (As opposed to 1 point a day for ordinary overdues.) This adds up very quickly! a. Try to renew Curriculum resources if you think you’ll be late returning them. You can do this online, wherever you are. b. Be especially careful to return Curriculum items on time, every time! International Picture Book Month is an exciting initiative to remind us about the value, creativity and importance of children’s picture books. 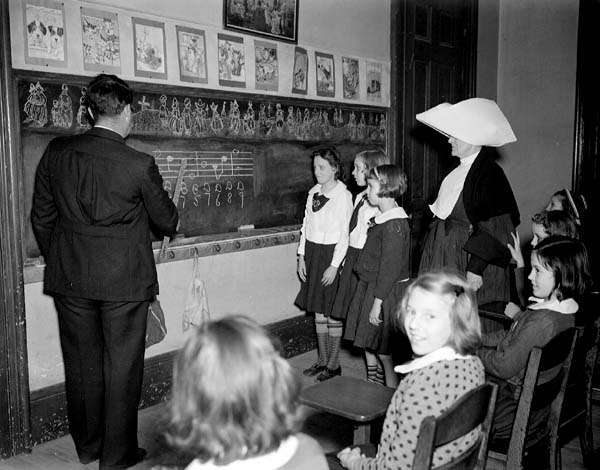 Organised by a group of authors, storytellers and illustrators (Founder, Dianne de Las Casas and Co-Founders, Katie Davis , Elizabeth O. Dulemba, Tara Lazar and Wendy Martin), over at their website (http://picturebookmonth.com) there is a post for every day of November reminding us of the importance of picture books. Everyone has a favourite Alison Lester (whether you read it to someone, or someone read it to you) My absolute favourite is the Journey Home with Wild and Woolley. Closely followed by Magic Beach. And Yikes. And Alice and Aldo. And Are We There Yet? I was obsessed with the detail of Graeme Base’s The Eleventh Hour and Animalia. 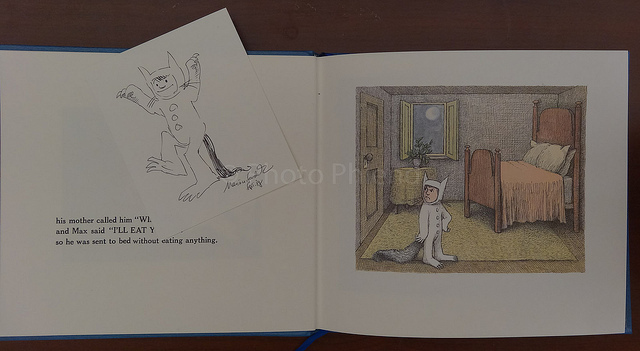 Have fond memories of Max from Where the Wild Things Are, Meg and Mog & The Velveteen Rabbit. And I was immediately transported back to my childhood by Robert Sabuda’s amazing pop-up edition of Alice’s Adventures in Wonderland. The Curriculum collection includes a wide range of Australian picture books and some international classics, so you can discover your favourites. All QUT Library users can borrow from the Curriculum Collection. If KG Library is not your home library, but you have chosen a title, you can also place an intercampus request online. So why not share a picture book this summer? As Picture Book Month highlighted, picture books are not only important for literacy and learning to read, but they are an essential part of the imagination and wonder of childhood.